Multiple sources suggest that Netflix and Hulu on Xbox One will no longer be pay-gated by Xbox Live Gold. Update: Microsoft has confirmed that its streaming apps for Xbox 360 and Xbox One (including Netflix and Hulu) will indeed no longer be behind the Xbox Live Gold paywall, meaning anyone with an Xbox Live account can use them. Original Story: If you want to use Netflix or Hulu on your Xbox 360 or Xbox One right now, you have to be an Xbox Live Gold member, which effectively means you have to subscribe to a paid service... in order to use a paid service. It's a little bit silly, and now, multiple sources are suggesting that even Microsoft has noticed just how silly this is. According to the Ars Techinca sources, Xbox users will soon no longer need a paid subscription to Xbox Live Gold to access Netflix, Hulu, and other streaming media apps. However, it's not all good news. 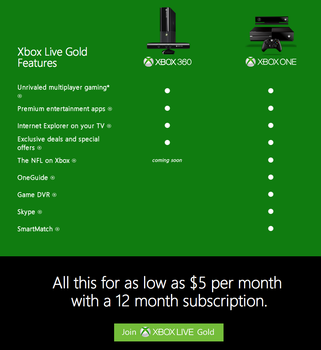 Other sources have suggested that Microsoft may shift other, currently free, services behind the Xbox Live Gold paywall to make up for this (though Ars Technica admits those sources could not confirm whether that includes existing services or if that only includes upcoming content like TV series from Xbox Entertainment Studios). Apparently, this possible upcoming change in policy is directly linked to a changing of the Xbox guard after Don Mattrick left the company to become Zynga's CEO. Just for reference, both Sony and Nintendo do not charge any kind of additional fee for users to be able to access streaming media apps on their systems. If true, this is certainly a step in the right direction, as it is somewhat ridiculous that Netflix and Hulu are paygated, considering Microsoft's focus on the system being a media center. We've reached out to Microsoft for comment on this story and will update if they respond.